During the last six years of traipsing around India, we have been guilty of making the same mistake that the Government of India has been making for the last sixty - neglecting the North-East. But unlike the government, our mistake was easier to fix. Just a few hours on the internet and a sizable dent in our retirement savings is all that took to address it and we were off on our next week long vacation: this time to see Assam, all of Assam, nothing but Assam. The first day was a carbon copy of our Sikkim trip: an early morning connection via Kolkota and its forgettable mustard oil based South Indian fares followed by a bumpy six hour drive up north. A welcome change, this time around, was a pit stop at Hajo where we could stretch our legs and also gape at the nearly half a millennium old Hayagriva-Madhava temple. After much jostling and a quite a bit of ado, we eventually reached Manas National park, our first destination of the trip. Manas National Park, straddling the India-Bhutan border, is one of the few places in the world where the mythical unicorns walk amongst the humans. However, the few unicorns here were introduced from Kaziranga, most of which are too afraid to venture beyond a shouting distance from the forest watch towers, and its tigers are even more mythical than the unicorns. Nevertheless, the park is worth visiting just for its scenery which ranges from blindingly thick jungles to sweeping savannahs to Himalayan ranges across the Bhutanese border. Our safaris turned out to be more than successful with sightings of herds of elephants, bisons and buffaloes. This being our first spring safari, we also got to enjoy the riot of wild flowers of all hues carpeting the forest floor. Day long jostling on the hopeless Assamese roads (which are remarkably poor even by Indian standards), brought us to the birder’s paradise of Nameri National Park. All that rock-and-roll took its toll on my DSLR lens which refused to recognise the camera body anymore. Thankfully, it was the wide angle that filed for the divorce from the camera and I could manage with the telescopic one for the following couple of days. Safaris in Nameri, as it a birding park, are on foot and raft. 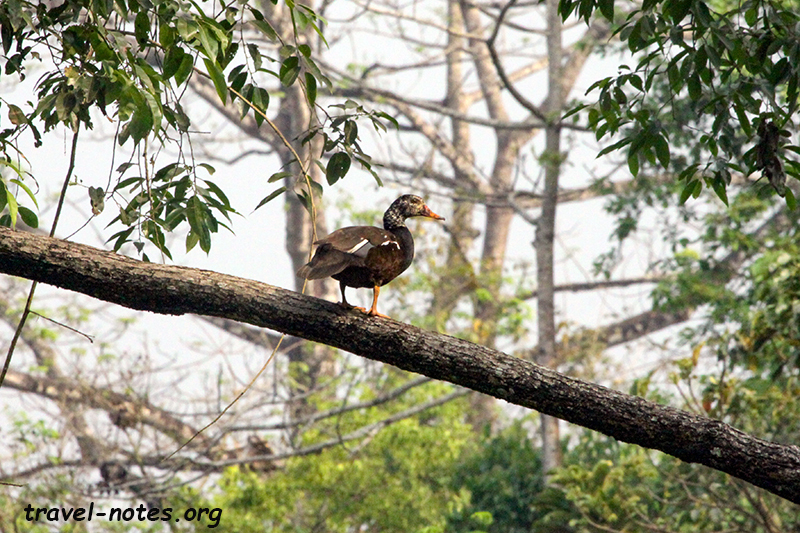 We did the foot first and lucked out on spotting the rarest bird in India, the White Winged Wood Duck, which also doubles up as the state bird of Assam. Moreover, we got to catch it in its classic pose of perching on a tree branch. Many professional photographers spend weeks in the park for this classic snap which we happened to just walk into. All of them would have traded their fortune for our luck and I would have returned the favour for their skill. The ensuing rafting safari was equally successful with us spotting the equally elusive Ibisbill, this time the rarity owes it to being migratory and not often found outside its natural habitat of Tibetan plateau. A short afternoon drive brought us to Kaziranga, the park with the largest concentration of the Great Indian One Horned Rhinoceros in the world. Watching these majestic beasts from atop a lumbering elephant is one of the highlights of any trip to Assam, or in life, for that matter. With the landscape resembling more of African Savannah than the usual Indian Dry-Deciduous, and with the area almost devoid of carnivores, the whole park is teeming with large happy herbivore herds. Watching these herds frolicking, head butting and partying all day from the comfort of a Jeep safari is no less memorable. Having completed the national-park leg of the trip, time was running out to fix the wide-angle lens before the cultural/monument filled second half. Luckily, both me and Aparna were trained mechanical engineers from three of the most prestigious universities in the world (this, this and this). With some random shaking of the lens, targeted yelling at it and violent threats of unspeakable damage we will be doing to it if it doesn’t co-operate, we got it to work at an acceptable level in one of the several incomprehensible modes that a DSLR throws at you. With the immediate problem having been addressed manfully, we proceeded to Majuli. With an area of ~420 sqkm and surrounded by the mighty Brahmaputra on all sides, Majuli is India’s largest river island and is widely and wrongly believed to be the world's largest. Ferries are the only way to reach the island and they are the one of the few ones in India that transport you along with your car onto the island. We reached there a week before the state elections, the only one among half a dozen such elections where the ruling party at the centre has a hope of winning it and Majuli is where their CM-in-waiting had decided to stand from. The mayhem of the elections was equally matched by the noisy animals which had successfully transformed our night stay – a traditional Mishing house - to a cacophonic Old McDonald farm. Amidst all this pandemonium, someone decided to use the front yard of our room to shoot the latest Assamese musical. Thankfully, we had to just walk a few hundred yards to enjoy the serenity that Majuli is famous for. 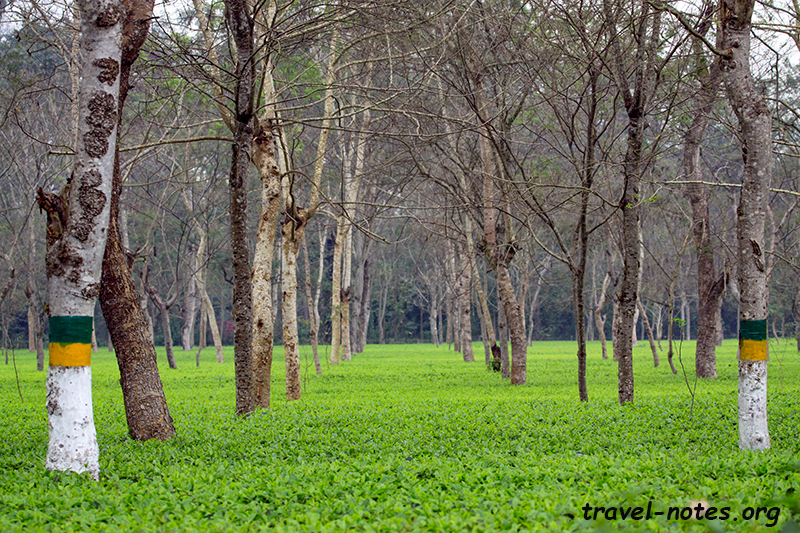 The following day, we checked out the other main attractions in Majuli – the satras. The neo-Vaishnavite culture (“neo” here is well over 500 years old) of monotheistic, monastic living with their exotic masked dances was started here by the famous Assamese saint Sankaradeva. Serene satras of Majuli is where you can find the unbroken line of one of the lesser known traditional cultures of India. Last day of the sightseeing saw us catching the early morning ferry out of Majuli onto the city of Jorhat on the mainland. Jorhat is the final resting place of one of the unsung heroes of Indian history, Lachit Borphukan, so unsung that very few of the locals could direct us to his cenotaph. We did eventually manage to reach there and pay homage to the man who had single handedly stopped the eastward expansion of the Mughal empire under Aurangzeb in the famous Battle of Saraighat. I am still bit bemused why I first heard of him through Wikipedia and not via my school history books. 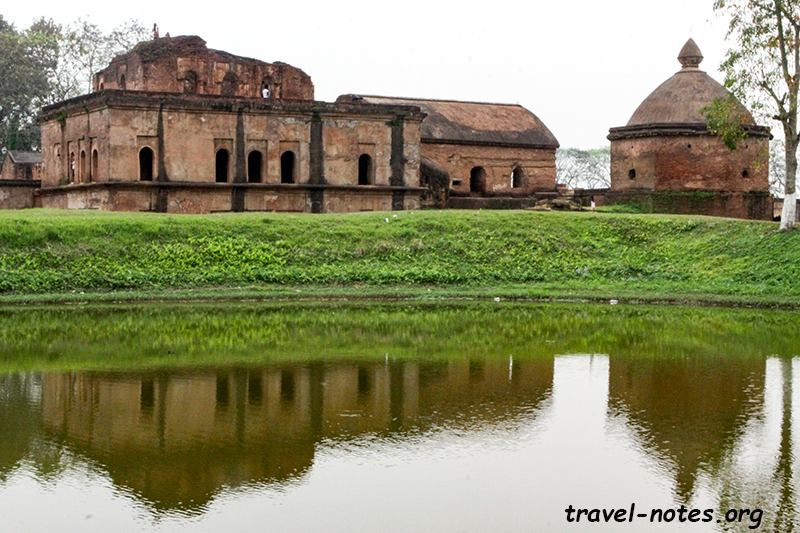 Ahoms ruled Assam for close to six centuries and the last of which they ruled from Sibsagar, a town located an hour east of Jorhat and where we headed to next. 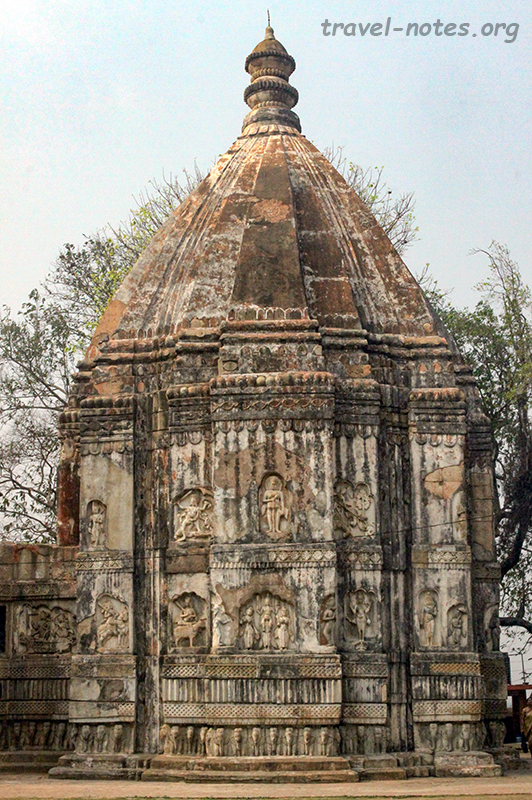 The smattering of ruins from that epoch makes an interesting stop, but the real must-sees are the “dols” three temples in one complex dedicated to the Indian trinity: Shiva, Vishnu and Shakti, all built in 1734 by the Queen Ambika Devi. The view of the massive 32 m tall tower (highest in India) of Shiv Dol is stride-stopping to say the least. We spent the last night of our trip in a British era tea bungalow in Dibrugarh. With French cutlery, bow-tie adorned butlers, the 1850s massive mansion made of the finest Burma teak was a complete contrast to traditional Mishing house on stilts of the previous two nights. The fact that these two ancient-style residences were a spitting distance away from each other is a worthy illustration of the diversity that exists in India. The following morning we had enough time to squeeze in a quick tour of a tea factory where both of us got to re-live our college days of watching large machines making loud noises drowning the explanations of the patient lecturer trying to explain why the said machines were making the said noises. Click here for more photos from Hajo, Jorhat, Sivasagar and Dibrugarh. 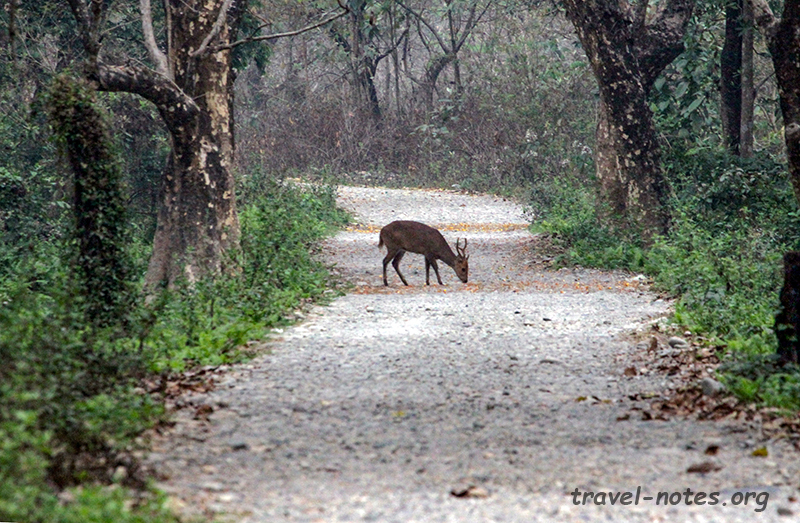 Click here for more photos from Manas National Park. Click here for more photos from Nameri National Park. 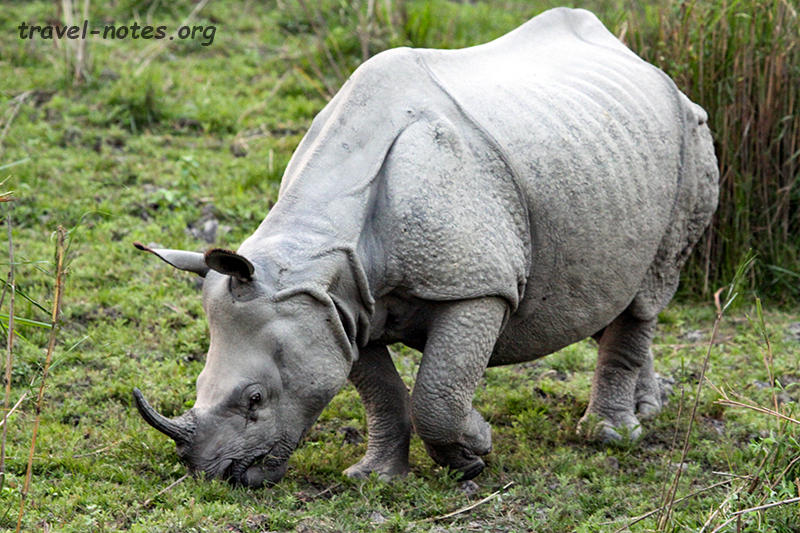 Click here for more photos from Kaziranga National Park. 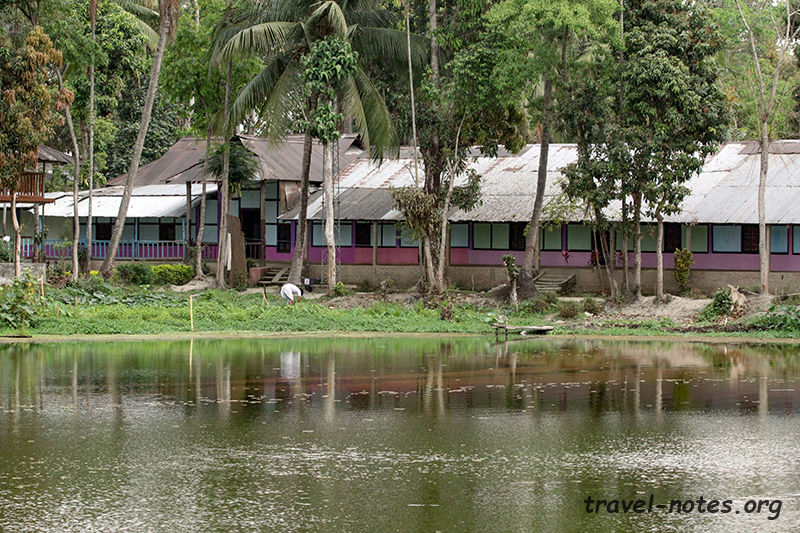 Click here for more photos from Majuli Island.